Communicator is a strategic email service provider, focused on helping ambitious brands optimise their performance across multiple channels. Communicator’s technology provides customers with everything they need in order to send highly personalized automated messages that truly engage customers and increase ROI. They work to offer flexible solutions that help clients drive results and achieve their objectives. Deliverability of the client’s email messages is at the forefront of our partnership with Communicator Corp. Our direct integration with Communicator ensures messages are one to one triggered to be the most relevant and timely for your customers. 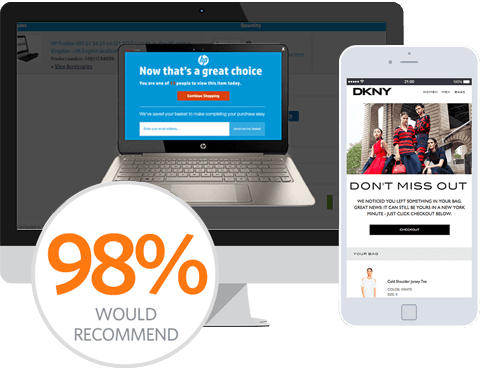 With SaleCycle campaigns, customers essentially receive emails based on their actual behavior and not their desired behavior, resulting in an improved customer journey and increased conversions. Triggered one to one emails combined with their targeted relevance ensures your emails are marked as highly legitimate keeping them in your recipient’s inbox and not in their spam box. One to one triggered emails. Send email based on actual behavior, not desired behavior. Communicator's relational data structure allows you to maximize your email relevancy and with multi-channel capabilities.